I have written of the way some blog sites intentionally encourage their readers to attack a person, hashtag, or some other target on Twitter. The most recent example I documented was an attack on Melissa Harris-Perry that twisted her impassioned defense of the poor into an emotional outburst of “hysteria”, an “eruption” of anger, and an uncontrolled “blow-up” at a conservative guest. These blog sites launched a frenzy of negative tweets about Harris-Perry, often with racial and misogynist overtones, and saturated Twitter for a day. But the excuse for the attack was a tweet she wrote yesterday morning; it expressed displeasure at the makers of the movie that may have been the motivation for yesterday’s attacks in Egypt and Libya. Her tweet, and the ones that followed to expand on the topic, are no longer visible on Twitter, but Dr. Butler makes the same case in an opinion piece published in USA Today last evening. You don’t have to agree with her conclusions to appreciate that when actions in the US result in the deaths of Americans overseas the topic is worthy of discussion. 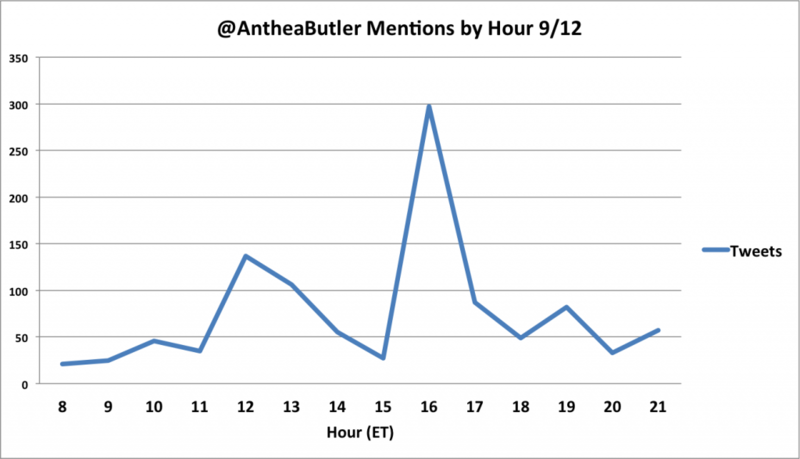 Yesterday, she went from her average of 100 mentions a day to 10 times that many, and the sentiment of yesterday’s tweets swung dramatically negative. You might think that this is just a reaction to her comments; many people strongly disagreed with them. But to think that this was an organic reaction would miss the hand of an outside force: Twitchy.com, a website run by Michelle Malkin, whom Wikipedia describes as a “conservative blogger, political commentator and author”. Twitchy.com is conservative and features Malkin’s style of snarky rants about the left served up with over-the-top faux outrage. Like in Spinal Tap, Twitchy is always set at 11. But just a very small one at first. Left alone, her comments would have gone unnoticed by almost everyone and would have faded into history. But they did not go unnoticed by Twitchy.com — or more likely her other critical comments about Mitt Romney and Reince Priebus caught Twitchy’s eye. One way or another, at 11:52 am, Twitchy posted its first article about Dr. Butler. In order to distort her comments into a more dramatic narrative, only a selected few of her tweets were republished on the site. 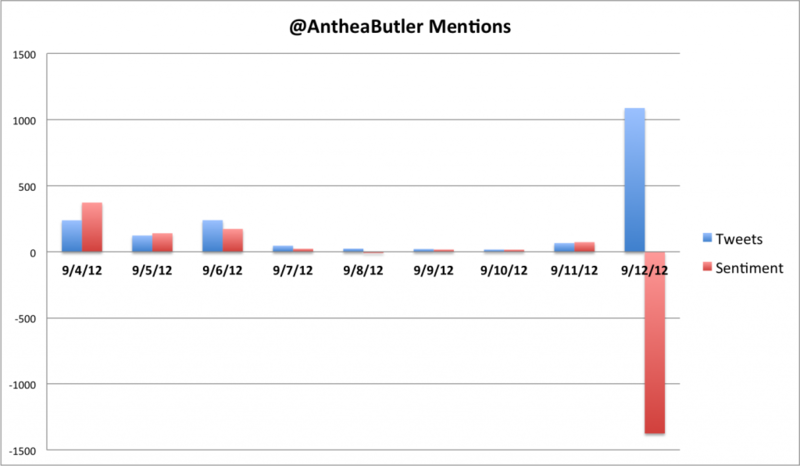 And that had the intended effect, driving a spike in the volume of Tweets about Dr. Butler in the noon hour. Things had calmed down again by 3pm (15:00 ET) as, presumably, Malkin’s minions were able to express their outrage and move on to the next topic. 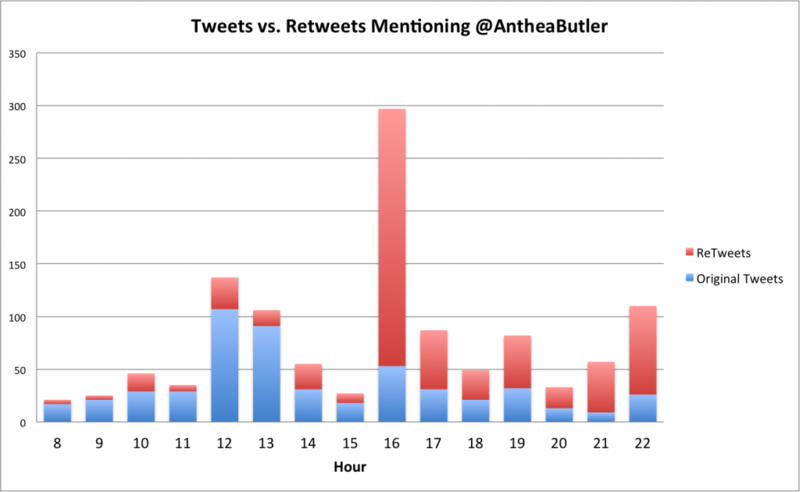 The mixture of Tweets (where people composed the message (or at least copy-and-pasted it) themselves) and Retweets (where people just re-send an existing message) switched dramatically, and the number of original tweets dwindled. Not surprisingly, most of Malkin’s followers just retweeted from a handy list of critical messages displayed on a Twitchy.com page. This allowed the convenience of one stop shopping where readers could refuel their outrage and then express it, all with just a few lazy clicks of the mouse. Other social media networks were involved, as well. Malkin posted the “story” to her Facebook page, which generated over 700 comments. The differences between the social media networks was interesting to observe. On Facebook, the equivalent to a retweet is a “like”, and there were over a thousand likes to Malkin’s post. The equivalent to an original tweet is a comment. Since Facebook allows for longer comments there was a much more varied response as some people wrote longer screeds. That additional length, combined with the more private feeling a fan page gives, allowed people to express themselves more fully and vehemently. But the biggest difference is that with Twitter, when you include a person’s @UserId in a tweet, the message is presented to that user as a reply or mention. Writing about a person in a Facebook comment, on the other hand, is not shared very widely, and the person mentioned is not bothered with notification. Facebook is an echo chamber, but Twitter is a megaphone. The bombarding of a user on Twitter with tweets can inundate them, and for someone who is not prepared for that volume it can be intimidating. Which, in the end, is the irony of the situation. Dr. Butler was essentially (albeit temporarily) chased off Twitter by Malkin’s Twitch-mob under the pretense of defending free speech, even when the real goal was to silence and punish her. Somewhat like a denial of service attack launched by a hacker with a fleet of infected PCs, Twitchy orchestrated the flooding of Dr. Butler’s Twitter account, forcing her to (only temporarily, I hope) make her account private as she withdrew from Twitter. The reveling Twitchers mocked her endlessly for that. The large risk to this is not the silencing of the victim; I doubt that Dr. Butler is anything more than temporarily inconvenienced. The risk is in the destruction of Twitter as a viable social media platform if it is abandoned by people who decide it’s not worth the aggravation. That is, as I tweeted earlier, a form of Gresham’s law: bad users drive out the good. This entry was posted in News, Opinion by Charles McGuinness. Bookmark the permalink.